The Wave On The Horizon? [E]ven if public outrage with the GOP persists at today’s levels, there good reasons to question whether the wave will endure through November 2014. 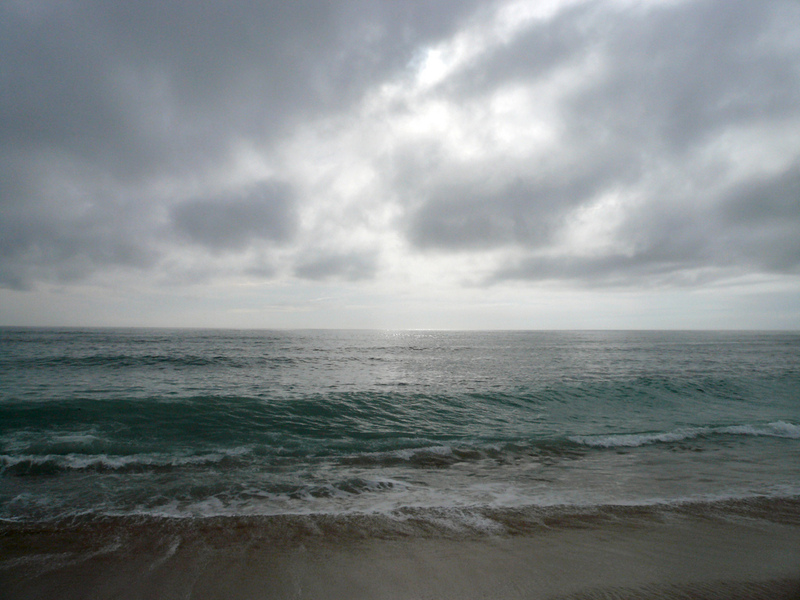 Unlike real waves, electoral waves shrink as they approach the shore. Political scientists have found that the generic ballot overestimates the president’s party this far from an election. That’s part of why Alan Abramowitz estimates that Democrats need a 13 point Democratic edge on September 1 to win the 17 seats necessary to retake the chamber in November. The thing is that expert ratings (like most polling) are not all that predictive a year out from an election. At this point in the 2006 cycle, there were 17 Republican seats in the lean or tossup categories (pdf). That’s well short of the 30 seats that Democrats would ultimately take from Republicans. At this point in the 2010 cycle, there were 28 Democratic seats in the lean or tossup category. Republicans, of course, went onto gain 63 seats in 2010. It’s not until later in the cycle when individual seat rankings become quite useful. That’s when potential challengers and incumbents read the national environment and decide to run or not. Chances are that if the 4-5pt Democratic lead holds, the individual seat rankings will reflect that edge. For now, individual seat ratings probably aren’t all that helpful to understanding which way and how hard the wind is blowing. However you slice and dice the history, the strategery, and the underlying issues, the decision to live with a government shutdown for an extended period of time — inflicting modest-but-real harm on the economy, needlessly disrupting the lives and paychecks of many thousands of hardworking people, and further tarnishing the Republican Party’s already not-exactly-shiny image — in pursuit of obviously, obviously unattainable goals was not a normal political blunder by a normally-functioning political party. It was an irresponsible, dysfunctional and deeply pointless act, carried out by a party that on the evidence of the last few weeks shouldn’t be trusted with the management of a banana stand, let alone the House of Representatives. And the key thing for responsible actors in the next year is to remind voters again and again about what this crew voted for: a second great depression to appease their ideological purity. They nearly got away with it. The lesson should not be relief and moving on; it should be continued outrage at this vandalism and brinksmanship and a demand for accountability. That means voting Democrat next year even if you disagree about many aspects of their policy proposals. Because this is not about mere policy. It’s about a party threatening to break apart the country if they do not get the rest of us to bend to their minority will and their apocalyptic vision. If that message can sink in with independents and moderate Republicans, then of course the Democrats can regain the House – and finish the job of the Obama presidency. I don’t like partisanship. But if it is an indispensable means to ending this level of blackmail of the entire system, then it is a necessary, short-term price to pay. “Even at the bitter end, on the last possible day to defuse the crisis before the debt ceiling was breached, over 60% of House Republicans voted to push the US government into default, with incalculable but almost certainly catastrophic consequences. This is a very important point, with very ominous implications, that shouldn’t be forgotten or obscured. Is it unfair, one-sided, or exaggerated to suggest that the national Republican Party has become a dangerous menace to the republic, with no clearly visible redeeming features? I don’t think so,” – Jeff Weintraub. Me neither. American taxpayers have once again been trampled by establishment Republicans – a thundering herd of chicken-hearted Republicans in Name Only (RINOs) galloping to the Left. The debt ceiling deal struck between Senate Majority Leader Harry Reid and Senate Minority Leader Mitch McConnell is a victory for President Obama and Democrats. ObamaCare is still the law of the land. The government is still spending money it does not have. And thousands of government workers just got a two-week vacation courtesy of the taxpayers. Let’s take the last three disappointments/wishes from the non-chicken-hearted. Yes, it is. But that’s because the president who proposed it and the Senate that voted for it were re-elected in 2012. That’s how our system works. Is it possible Todd Starnes doesn’t know this? No, it isn’t. So it is fair, I think, to infer that he believes that because his party regards this centrist, private-sector-dependent reform as an “abomination”, the federal government should be shut down permanently and the country’s credit destroyed, prompting a global depression. And that’s why this episode has been so disturbing. It is not that the GOP doesn’t have a perfect right to vote against Obamacare a zillion times; it’s that they responded to their electoral loss in 2012 by threatening to destroy the entire polity and economy. That is not a tactic or a strategy; it’s a declaration of war against the system of American government. Yes, it is. But almost all the current debt is a function of massive tax cuts in 2001 that were never paid for (by the GOP), two bank-breaking wars that were never paid for (by the GOP), a big new entitlement for seniors, Medicare D, that was never paid for (by the GOP), and the revenue sinkhole provided by the worst recession since the 1930s (begun before Obama took office.). The scale of the debt thus acquired is vast. I think Starnes is absolutely right to make its reduction a priority. The question is a pragmatic one – how do we cut entitlement and defense spending along with raising revenues to get there? One side is prepared to consider cuts in entitlement programs it cherishes; the other side is resolutely opposed to any net revenue increases at all. One side could begin to negotiate a debt deal that was 2-1 spending cuts to tax hikes; the other side refuses to negotiate even a 10-1 deal. What, for example, does the GOP offer the Democrats on fiscal matters right now? I see nothing. If one side is prepared to give nothing, no deal can be done. And if the Tea Party is right about the urgency of cutting the debt, no deal is very bad fiscal news. And part of the pragmatic solution is recognizing that immediately ending the government’s current deficit by spending cuts alone would so vitiate economic growth that it would be counter-productive. Starnes is therefore not actually serious about the debt, and neither is the Tea Party. Their proposal for an immediate balancing of the budget would deepen the debt; and their absolute refusal to countenance any net new revenues to the federal government means they will never get an actual compromise that would actually cut the debt in a meaningful long-term way. In other words, their absolutism on taxes essentially destroys their debt-reduction position … as long as we remain in a constitutional democracy with two parties trying to represent all the people. If the president were saying that he does not care about the debt at all, it would be one thing. 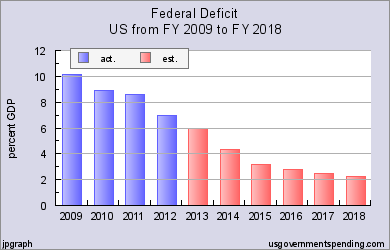 But, this president, on current trends, will have brought the deficit down from more than 10 percent of GDP when he took office to around 3 percent when he leaves, during a still tepid recovery (see graph above). What more can these people demand – except, of course, his resignation? And again, that’s why this episode should not be regarded as anything but a deeply serious political and constitutional crisis. One party is refusing to accept that the other one exists, that not all of America agrees with them, and that democratic norms require compromise in that context. This demonization of government itself, and generalized slur against all those who work for it (and who are also tax-payers) is not just an insult added to injury. It is another attack on the entire system. 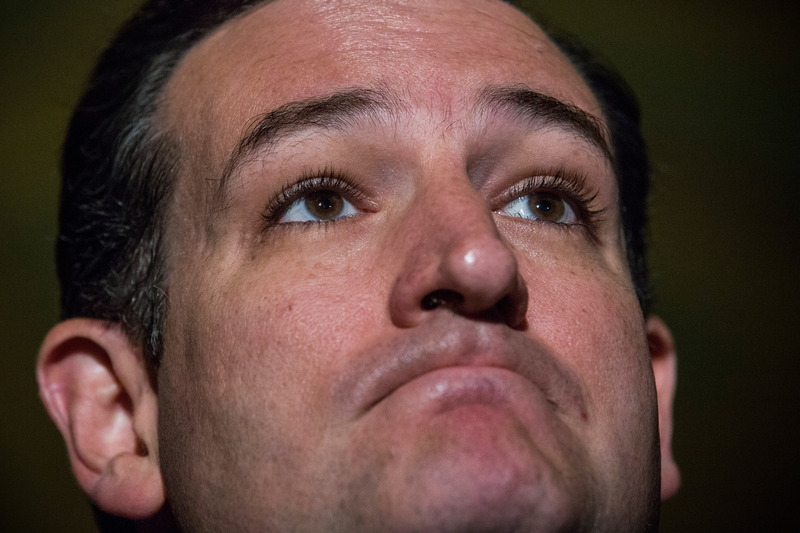 As we found out in the fiasco, even Ted Cruz likes government sometimes. For him, it is about keeping monuments open. For other Republicans, it is about scientific research. And the broader point is that government is the point of politics. There has to be a governing authority that commands universal assent in any functioning democracy. Yes, it should be solvent and run surpluses in peacetime. But it must exist. And conservatism in its proper sense is about governing firmly, securing the rule of law, and sustaining the legitimacy of the democratic system. What the Tea Party represents, in stark contrast to conservatism, is a radical attack on the very framework of our governing system. It is not right or left within our democratic system. It is a form of secession from it and a de facto abandonment of the notion of one country under one rule of law. It is about sabotage rather than opposition. It is bad enough when one party will seek to sabotage the law of the land – by attempting to rally the public to spurn the new healthcare law, in the hopes of causing it to collapse. But when the dominant faction of one party is bent on sabotaging our democracy, it must not simply be tolerated or appeased the way John Boehner shamefully did. It must be defeated. Anything less is a form of appeasement of forces and ideas that are truly antithetical to the democratic way of life and to constitutional governance. Yes, in my view, the situation is that grim. If the Republican right’s fanaticism still blinds them to the error of their ways after they nearly destroyed the global economy (and brutally damaged the American one), it becomes clear that only a total collapse of the American government and economy could truly teach them the futility of their deluded aspirations. The rest of us cannot and must not tolerate that. We must draw a line. That line, for those who still believe in the regular order of our democracy, is November 2014. This is like a pre school that’s gone awry. “[The Obamacare defunders] hurt the conservative movement, they hurt people’s health care, they hurt the country’s economic situation and they hurt the Republican party … These are the people who said, ‘Plan: Step One, Invade Iraq. Step Two, It turns into Kansas,’ Could I ask if there’s anything in between Step One and Step Two? ‘Oh ye of little faith,’” – Grover Norquist. Obama will negotiate with Iran and Russia/Syria but not Congress. Can we ask the Iranians to trade their nukes for a delay in Obamacare? Obama overplayed his hand claming sequester stopped WH Easter Egg hunts. Now he hits WWII vets/kids parks as his hostages in debt fight. Obama's popularity dropped to new lows 41%..This peevish response to being asked to restrain his runaway spending is not working well. [R]ed state and Southern representatives voted overwhelmingly against the Senate compromise: 27-91 in the redstates, 25-88 among Southern representatives. Republicans from the Northeast and Pacific voted “yes” by 30-16 margin; the blue states voted “yes,” 32-17. But compared to the fiscal cliff vote, the GOP might be even more cleanly divided along lines of vulnerability and ideology. 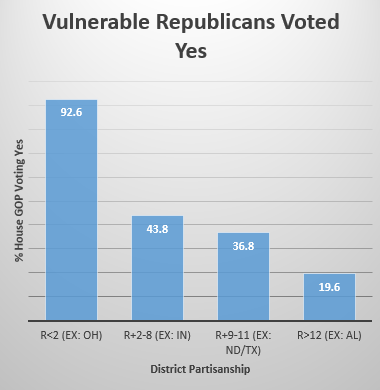 Republicans from more competitive districts, with a Cook PVI of R+2 or more Democratic, voted almost unanimously for the Senate compromise. [A]ny way you slice it, the majority of the [Republican] Conference voted to continue a government shutdown and a debt limit threat that were not working very well for the GOP or for the country. Yes, it gets worse. Surveying the far right this morning, much worse. They didn’t panic because they figured Congress would do the right thing at the last second, just like always. They were right. [M]arkets have wised up to Congress’s brinkmanship habits. Anticipating that Congress would inevitably raise the debt ceiling, markets showed only a tepid reaction this week to the threat of default. To be sure, we saw nervousness in bond markets as the Treasury came close to hitting its borrowing ceiling. Still, we are a long way from TARP I: The defeat of the first TARP bill in September 2008 precipitated a market free-fall that forced the parties to the table. With markets a bit more attuned to how polarized parties legislate, we can no longer count on adverse market reactions to discipline recalcitrant leaders into coming to the table. This may prove a worrisome development in future episodes of brinkmanship when the blame game delivers a less decisive blow to one party or the other.